It has taken 25 million years, but scientists say getting the first glimpse at what a long-extinct giant penguin looked like was worth the wait. Experts from New Zealand and the United States have reconstructed the fossil skeleton of one of the giant sea birds for the first time. The penguin bones were collected in New Zealand in 1977 and reconstructed beginning in 2009, and the results were published February 27, 2012, in the Journal of Vertebrate Paleontology. Researchers dubbed the penguin Kairuku, a Maori word that loosely translates to “diver who returns with food.” Researcher Dr. Dan Ksepka, North Carolina State University research assistant professor of marine, earth and atmospheric sciences, said he was interested in the fossil because its body shape is different from any previously known penguin, living or extinct. 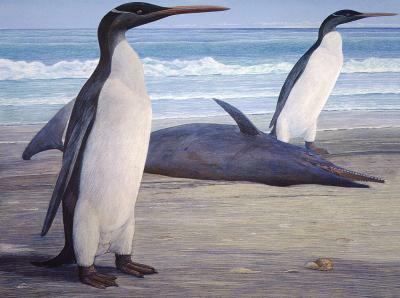 Kairuku was one of at least five different species of penguin that lived in New Zealand during the same period. The diversity of species is part of what made the reconstruction difficult, and the penguin’s unique physique added to the difficulty. Kairuku was an elegant bird by penguin standards, with a slender body and long flippers, but short, thick legs and feet. According to Ksepka If they had done a reconstruction by extrapolating from the length of its flippers, it would have stood over 6 feet tall. In reality, Kairuku was around 4-feet-2 inches tall or so. The researchers reconstructed Kairuku from two separate fossils, using the skeleton of an existing king penguin as a model. The result is a tall bird with an elongated beak and long flippers, easily the largest of the five species that were common to the area in that time period. For more information watch video below.